I have a new looooooove. Even a new obsession, if you will. Shocking. I know! I’m back again with another one of my stupidly simple recipes – one I’ve been enjoying as we finished up the last few weeks of cookbook intensity. While I’ve been cooking so many crazy things lately in the kitchen – and LOTS of them all at once – it’s been so nice to enjoy some of these reeeeeeally easy meals for lunches or mid-afternoon snacks. Guys. I don’t even know what I’m going to do when we’re no longer photographing and making 48 recipes per week. Ooomph. I’m no stranger to marinated beans, doing it with these chickpeas last year and falling in major love. They quickly became a staple in, well, my life. I love having them just to snack on or throw in a salad or whatever. Beans easily rank up there as one of my favorite foods, but chickpeas aren’t my number one. Roasted chickpeas miiiiight be number one, but I don’t always think to set my oven to 425 and roast ‘em. I’m impatient to say the least. White beans however? THE BEST. I love their creaminess. They are hearty and comforting but light at the same time. And they go with SO many different flavors. Yes you heard that. They go with all the things. I didn’t stray much from my original marinated chickpea recipe. But here, I added a lot of feta, some chopped roasted red peppers and a few diced sun dried tomatoes. Lots of lemon juice! Tons of herbs, some seasoning and lots of olive oil. Speaking of! I love taking some hearty bread and toast it in a skillet with olive oil. It gets so golden and crunchy and gives you the perfect vehicle for eating the white beans. The combo is embarrassingly easy, but it’s SO good that I can’t keep it hidden. I love it when I find a lunch that tastes so good and comes together in minutes. Because a lot of times I don’t even realize I’m hungry until I start digging into an open cereal box. I thought this was the most perfect recipe to bring the first day of Spring. OH my GOSH. It felt like winter lasted forever, so I could not be happier to switch over to a new season. I’m envisioning packing these beans into little jars and grabbing a crusty baguette, lots of cheese, some fruit and picnic blanket for the most perfect outdoor happy hour. And wine! I mean, it’s definitely rosé season now, right? Place the beans in a large bowl. In a small bowl, whisk together the oil, vinegar, lemon juice, herbs, honey, garlic, oregano salt, pepper and red pepper flakes. Pour over the beans. Stir in the feta cheese, red peppers and tomatoes. Cover the bowl in plastic wrap and stick it in the fridge for at least 30 minutes. It will have the most flavor that way – but you can obviously eat it right away! To make the olive oil toasts, drizzle your favorite bread with olive oil – liberally! Heat a skillet over medium heat and add the bread to the skillet once hot. Toast until each side is golden brown and crunchy. Serve the beans on top of the toasts! Yesssss this is totally a meal. Looks delicious! The warmer weather definitely has me wanting to make more salads. Photographing 48 recipes per week? You are amazing! Yum! This looks so good + I love the simplicity of it as well. Will definitely be trying it this week :) ps. I love beans too! they are one of the best foods! This looks so good! I cannot wait for the weather to warm up a bit more so I can have this for a lazy Saturday lunch, with wine and bread I can think of nothing better ? normally i add veggies to marinated beans and call it a day and eat as is. but with crispy toast drizzled with fruity olive oil?! even better. Oh my goodness this looks like the perfect lunch! Oh gosh, I have this new obsession with white beans. They go in almost everything and can be made into almost anything. And this humble legume can even be turned into something totally fancy, like this marinade. Dinner? yup. could not agree more. they are so underrated! Can it be eaten warm? I cant imagine eating cold beans. Just ate ate (slight variation of) this recipe for lunch. Olives instead of tomatoes, and no feta. i’m intrigued… always up for quick meals but usually prefer my beans cooked, so i’ll have to try this out! thanks gabrielle, i fixed it! All ingredients of this recipe are very healthy. I will add this recipe in my healthy diet plan. Thanks for sharing this amazing recipe. Growing up we ate a lot of beans — Italian mamma being very economical. So, when I got older I pooh, poohed beans, but now — I”m baaaaaaack! Yes, I am back to eating them and loving every minute of it. I’ve pinned your recipe. Great to have on hand in the fridge when I’m busy outdoors and then come in for lunch ravenous!! Happy second day of spring. I am completely OBSESSED with your marinated chickpeas! I make them at least once a week. I have to hide them in the fridge so I don’t et the whole bowl all at once. So much YES here. Loving all of these flavors together…and on toast? Definitely. LOVE. This looks yummy. Although I make salads with beans or other legumes or quinoa several times a week, I tend to pile on the chopped vegetables. Sometimes less is more. Just some roasted peppers, with white beans. Why not! Truly, more people should eat like this. Beautiful, easy, fast—my favorites all around! I’m obsessed with beans! I don’t eat any dairy or meat, so I rely on beans a lot for my protein. Thanks so much for sharing such a fun recipe. Never thought to make olive oil toast but it sounds fancy AF and I can’t wait to make! This looks so delicious. Can’t wait to try this in the summer. Are you writing another cookbook on n the future??? I am obsessed with Seriously Delish and want more!!! I stumbled onto this while googling your name for more cookbooks….glad I did too but would REALLLY love another book!!!! i am barbara! i’m finishing it up right now and it will be available in the spring of 2018. thanks so much!! 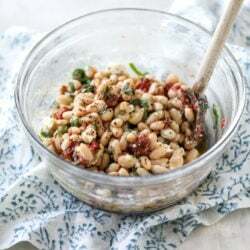 am impressed, simple but not really, i mean, not in flavor, looks really nicely balanced, white beans, you’re right, great idea and thing on top of doing a cookbook is really impressive so thank you for this! Making this for work lunches this week & adding marinated artichoke hearts. It’s actually making me look forward to the work week! Beautiful looking recipe! Sounds absolutely delicious, I can’t wait to try it at home! Not even a bean person but I totally love this!! I made this. It was delicious. I didn’t have red wine vinegar, so I subbed apple cider vinegar and it was lovely. Also, I am one of those folks who can’t take the taste of cilantro, so I left it out. Otherwise, I made it as is and it was fabulous!! Will make again, soon!! OMG. This reminds me of when I lived in Spain! Also, love stupidly simple recipes. They’re so underestimated and often taste the best! This is definitely happening this weekend. Thank you! You know it’s a great recipe when your family requests this over and over again! Perfect recipe, didn’t change a thing and I eat it as leftovers for several days. Thank you! Can’t wait to try this when we do our tapas evening next week. Can it be made the evening Before? This is sooo good. Everyone I make it for just loves it. Need to double the recipe next time. And love how easy it is. This is the best meal in the history of ever. No disputing. I have made this more than 10 times since I first found the recipe about a year ago. My family loves it. I make it for lunch or a light dinner, and I’ve brought it to share at parties. It is one of my favorite dishes! Thank you!!! Pingback: Wish. Hope. Life. - Na vlnách pátku » Wish. Hope. Life. Happy, Healthy and a Peaceful New Year!! Every Thursday, my friend comes over after work and we have our happy hour. This coming week, I plan to make your wonderful looking beans and place them inside mini colorful peppers as an appetizer – always looking for something different. Thank you. Hi! I made this and it is soooooo good! I didn’t have the fresh herbs so I used the dried oregano from the recipe and added a bit of dried rosemary. Omg! This is def going into the recipe rotation! Thanks for sharing!